Reynolds Polymer team poses with their SHARP plaque. Left to right: Will Simpson, plant manager; Mark Johnson, vice president of sales; Bill Raimer, chief financial officer; Paul Gardner, vice president of engineering; Matt Johnson, safety manager; Bryan Barboe, director of operations; Bart Baker, vice president of global operations; Scott Sullivan, president; Casey Barnes M.S., CSP – Colorado State University on-site consultation program safety consultant, and Layne Sargent M.S., CIH, CSP – Colorado State University on-site consultation program health consultant. Grand Junction, CO-based Reynolds Polymer Technology, Inc. focuses on building the impossible through their proprietary acrylic formula and casting process. Reynolds Polymer started out as a division of a larger company in the early 1980s, focused on manufacturing acrylic windows for aquariums. Reynolds Polymer was able to translate their success in the acrylic industry into a solo venture, and the company received their incorporation status in May 1987. In the beginning, the company kept their primary focus on the water-retaining business. However, as the Reynolds Polymer business has grown, their product offerings have expanded to include scientific, medical, and architectural industries. With over 30 years’ experience, Reynolds Polymer is constantly reinventing the definition of what can be done with acrylic, resins, and composites. They are able to push the boundaries of acrylic architecture through their advanced casting process and proprietary acrylic formulation. Unlike the rest of the industry that laminates multiple, thinner acrylic sheets together, Reynolds Polymer custom casts each project to the desired thickness. This process allows for better optical and thermoforming properties, thus permitting greater design freedoms. When the OSHA On-Site Consultation Program began working with Reynolds Polymer in 2013, the company was laying the groundwork of their health and safety with guidance from Matt Johnson, safety manager for Reynolds Polymer, and the support of upper management. OSHA On-Site Consultation Program offers no-cost and confidential occupational safety and health services to small- and medium-sized businesses in all 50 states, the District of Columbia, and several U.S. territories, with priority given to high-hazard worksites. These services are separate from enforcement and do not result in penalties or citations. Consultants from local agencies or universities work with employers to identify workplace hazards, provide advice for compliance with OSHA standards, and assist in establishing and improving safety and health programs. In Colorado, On-site Consultation services are provided through Colorado State University, Department of Environmental & Radiological Health Sciences, Occupational Safety & Health Consultation. 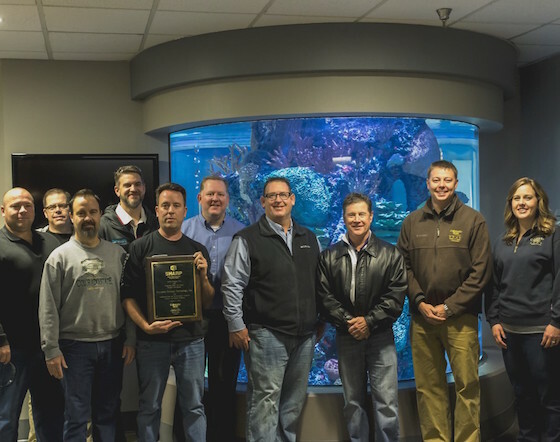 During a 2013 meeting, Johnson and the Reynolds Polymer team expressed their goal and commitment to achieve an OSHA Safety and Health Achievement Recognition Program (SHARP) award. The program recognizes small business employers who have used OSHA’s On-Site Consultation Program services and operate an exemplary safety and health program. Acceptance of a worksite into SHARP from OSHA is an achievement that singles a company out among its business peers as a model for worksite safety and health. Over the next three years Johnson, management, and employees worked tirelessly to elevate the company’s safety program from good to outstanding. Along those lines, in August of 2016, Reynolds Polymer earned recognition as a SHARP participant. Several health and safety practices contributed to Reynolds Polymer success, these include the company’s STOP program, OSHA 10- and 30-hour training, and their commitment to engineering controls. Reynolds Polymer uses their Safety Training Observation Program or STOP, to detect hazards, track their correction, involve employees in the safety program, and increase safety knowledge and awareness. Each employee fills out a STOP card on a monthly basis. This activity requires an employee to watch a task being performed and convey what positive and negative safety behaviors they observe. The STOP card allows the employee to praise positive safety behavior of a co-worker and offer suggestions on ways a job could be modified to improve its safety. Employees receive feedback on their STOP cards, and are recognized when they make suggestions that improve employee safety. In addition to monthly STOP cards, employees also fill out a daily job hazard analysis (JHA) card on a task of their choosing. The JHAs and STOP cards help to keep safety on the forefront for all Reynolds Polymer employees. In addition to safety training conducted for the STOP program and necessary OSHA written programs, Reynolds Polymer is going above and beyond by offering OSHA 10- and 30-hour cards to their employees. Johnson teaches the courses in-house, and management supports his efforts by allowing employees to complete their training during normal working hours. At this time, 70 percent of employees have received their OSHA 10-hour card, with the long-term goal of having 100 percent of Reynolds Polymer employees earn a 10-hour card. Originally, OSHA 30-hour courses were reserved for managers and supervisors. However, the 10-hour course has been such a success that non-managerial employees are requesting to take the 30-hour course as well. Reynolds Polymer also invested in exceptional engineering controls as well. The company invested over $300,000 in a state of the art ventilation system to keep employee exposures well below OSHA permissible exposure levels. In addition to their engineering controls, the company operates an extensive air- and noise-monitoring program. Reynolds Polymer purchased industrial hygiene monitoring equipment, and employees wear air-monitoring badges while working. These surveillance methods ensure employee exposures remain well below OSHA permissible exposure levels. Because of the unique nature of their work, Reynolds Polymer fabricates many of their production tools and equipment in-house. Safety is always included in the design of these tools and equipment, effectively engineering out potential hazards. These safety practices in combination with management support and employee commitment have led to the success of Reynolds Polymer’s safety culture. The company has seen this hard work literally pay off. From 2013 through 2016, Reynolds Polymer’s average recordable case (TRC) rate was 2.8, and their average days away from work, job restriction or transfer (DART) rate was 1.7. Their TRC and DART rates for this period were significantly below the Bureau of Labor Statistics industry average TRC and DART for these years. For North American Industry Classification System (NAICS) code 326113, BLS reports the industry average TRC rate was 5.3, and the industry average DART rate was 3.1. In 2017, the company’s TRC rate was 0.0, and their DART rate was 0.0. However, 2016 is the most recent year BLS data are available. In 2015, Reynolds Polymer’s dollar value of worker’s compensation claims was almost $3,000; in 2018, that number fell to just over $400. The company has also experienced over $20,000 in savings on their worker’s compensation premiums since 2015, and Reynolds Polymer has an impressive experience modification rate of 0.70. In addition to the financial savings, the company has experienced they have also met their goal they set back in 2013. In 2017, Reynolds Polymer earned a 3-year renewal as a SHARP site, awarding the company SHARP status until 2020.